Purity of intent is the foremost of all conditions. It means that one should read the Qur’an only to obtain guidance from it and not for any other purpose. If a person has some other purpose in mind, he will not only remain deprived of the blessings of the Qur’an, but he may also get further away from the Qur’an than he formerly was. If he studies the Qur’an in order to be an exegete so that he may get some fame and mundane interest, he might achieve this target but he will never get to the true comprehension of the Qur’an. Similarly, if a person studies the Qur’an to notch up some arguments for his preconceived notions, he may succeed in getting some distorted testimonies for them, but at the cost of understanding the Qur’an. It means that God leads only those people astray who out of their own free will deviate from the right path. The second condition for studying the Qur’an is that it should be acknowledged as a superior word before one embarks on understanding it. If a person has no idea of the high esteem and significance of the Qur’an, one cannot work so hard as needed to grasp its sublime treasure of wisdom. Someone may find this point absurd that one should be in such a highly positive frame even before setting out to study it. But in my opinion having a favourable preview of the Holy Qur’an beforehand is not an absurdity at all. In fact, it is a very sane and logical attitude. After all, the Qur’an has a magnificent history behind it. Its impact has been glorious. The miracle it has shown in changing human minds and ideologies stands unparalleled. Moreover, millions of people in the world not only accept it as merely a Book, rather they regard it to be a Divine Book, a word revealed from the divine tablet. They acknowledge it as a inimitable word whose peer has never been presented by either man or jinn and neither will they ever be able to do so. A Book about which exist such glorious testimonies of the past and present and which is held in such high regard by people no doubt has special importance and one can aptly comprehend it only if one has the idea of its reverence and importance. If a person has no idea of this importance of the Book, it is impossible for him to reflect on it so deeply as is essentially required. If it is known that a particular piece of land contains gold and a huge amount of gold has already been excavated from it, then it is rightly expected that more gold will be obtained on further digging. And again, whatever resources are spent on benefiting from such a piece of land are proportionate to its utility. But if a mine is considered to be a dung-hill, that is to say that if it is dug, only coal or lime stone would mostly be found, then there can only be two outcomes: either nobody will like to waste his time at all on it or if someone does something, it will merely depend upon what benefits he is expecting. This warning has been sounded because there are several misunderstandings about the Qur’an rampant among the people in whose presence the amount of effort and the extent of attitude the Book actually deserves cannot be mustered. These misunderstandings are present in both believers and deniers of the Qur’an. The deniers somewhat admit that some reforms were brought about by this Book during a certain period of time. But now, in their view, the time has passed. The Book, they maintain, may have been useful for the Arab Bedouins to tackle their simple problems, but it is not useful enough to deal with the complex issues of the day. On the other hand, its believers consider it to be a doctrinal code that explains the lawful and the unlawful and after the separate compilation of jurisprudential decrees if there remains any significance of the Book, it is by the point of view of benediction only. Some of them just consider it to be a collection of exhortations. Many of the people find it as an instrument for transferring the reward of its recital to their dear departed ones as well as for softening the agony of death. A lot of people use it as an exorcism for getting rid of calamities and misfortunes. Just as Christians merely keep the Gospel in their heart-side-pocket, Muslims also have adopted a similar attitude. Such Muslims who have these blatant misconceptions about it cannot be blessed with its true benefits for which it was actually revealed. They are as naive as a person who is provided with a canon to demolish the fort of an enemy but he regards it as a mosquito-killing-machine and starts killing mosquitoes with it. In order to truly benefit from the Qur’an, the third most important condition is to have a firm resolve of transforming oneself according to the dictates of the Qur’an. When one deeply studies this Book, one feels that what it demands from a person is entirely different from his own wants and desires. He realizes that not only are his own ideals and thoughts different from those of the Qur’an, but also his dealings and social affairs exceed the limits imposed on them by the Qur’an. He does not find his inner as well as outer self in consonance with the Qur’an. After realizing this difference a determined and an ardent seeker of truth decides that whatever be the situation, he will adapt himself according to the requirements of the Qur’an. By sacrificing everything and bearing various hardships and by surmounting every hindrance that blocks his way, he strives to mould himself according to the life envisaged by the Qur’an. But a person who lacks will and strength, is never able to fill up the yawning gulf between the Qur’an and himself. He feels that if he tries to change his beliefs and ideals according to the Qur’an, he will have to undergo a tremendous mental change. He thinks that if he moulds his conduct and manners according to the Qur’an, he will have to alienate himself from the society. He fears that if he commits himself to the objectives set by the Qur’an, he will not only have to abandon all his mundane interests and pleasures but rather he may also have to bear severe hardships like undergoing a jail sentence or even be executed for his beliefs. He dreads that if he scrutinizes his financial means in the light of the Qur’anic criterion of the lawful and the unlawful, he will not only have to give up all the luxuries and comforts of life he possesses, but he might also have to end up worrying for his bare minimum succor. Not everyone is capable of confronting such a turbulent life; only those who have a very high moral character and firm determination can face these ordeals. There are some impudent people who always adhere to their sensual desires, even though they may immodestly confess that the Qur’anic path is the only correct path, but at the same time, it is very difficult to follow. But there are some hypocrites as well who are very fond of posing their cowardice as ambition and hypocrisy as faith and always try to quench this passion by different means. Some people turn the illegitimate into the legitimate and the lawful into the unlawful on the pretext of being helpless and being compelled to do so because of adverse circumstances. Some cover up the truth with falsity by the aid of misleading and distorted interpretations. Some seek protection of expediencies and call-of-the-time for all of their wrong doings. Some try to distort the meanings of the Divine Book like the Jews had done in the Torah. Some try to find a midway between belief and unbelief, that is to say, they follow only that part of the Qur’an which they find to be in accordance with their own desires while they ignore that which is against their wants. Reflecting on the divine Book is the fourth most important condition to benefit from the Qur’an, which it itself mentions repeatedly. The companions of the Prophet (sallallahu alaihi wa sallam) were the foremost addressees of the Qur’an. They would ponder and deliberate on the Qur’an and the most distinguished among them in understanding the Qur’an were those who reflected on the Qur’an the most. They formed groups for studying theQur’an wherein the connoisseurs gathered together to study the Qur’an collectively. These groups were a matter of keen interest for the Prophet (sallallahu alaihi wa sallam) himself. After him, all the Rightly Guided Caliphs, particularly ‘Umar (rta) evinced constant interest with such groups and with people who had become adept scholars of the Qur’an. Reciting without understanding the Qur’an just for the sake of obtaining blessings was not the way of the Companions of the Prophet (sallallahu alaihi wa sallam). This style of reading the Qur’an came into existence much later when people began to consider the Qur’an to be merely an auspicious book rather than a document of true guidance. 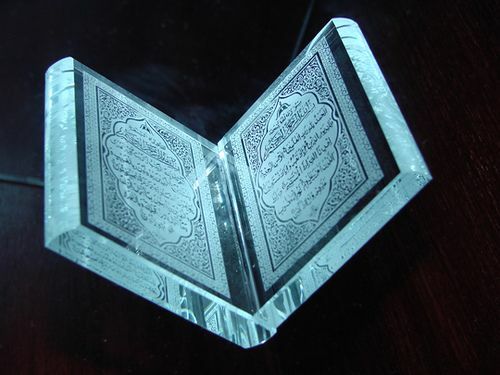 The Qur’an thenceforth came to be used for softening the agonies of death and for transferring reward to the dead; Instead of being used for obtaining guidance in the vicissitudes of life, it became more of a charm that would be recited to herald the opening of some wrongdoing in order that it may bless this wrongdoing and convert it into something ethical. People began to use it as an exorcism to protect them in accomplishing their satanic purposes. The Qur’an is perhaps the only book in the world which lays so much emphasis on the fact that it can be truly beneficial only and only when it is reflected and deliberated upon. But it is an undeniable fact as well that it is this very book which is always read with closed eyes. People read the most trivial of things with attention and concentration in order to understand them but they deal with the Qur’an in an amazingly different way. When they begin to read it, they close their minds lest even a semblance of its meanings may penetrate into them. O God! I am Your slave, Your slave’s son, Your bondwoman’s son. I am in Your full command. For me Your judgement is just. By virtue of all Your Names which are just Yours, by which You called Yourself in Your Book, or which You made Your creature learn, I beg You to render the Qur’an the freshness of my heart, the light of my soul, a relief to my grief and a cure of my distress and sorrow.